Cancun offers a lively yet stylish retreat, where gorgeous beaches are accompanied by modern shopping malls, exquisite restaurants and swanky bars. 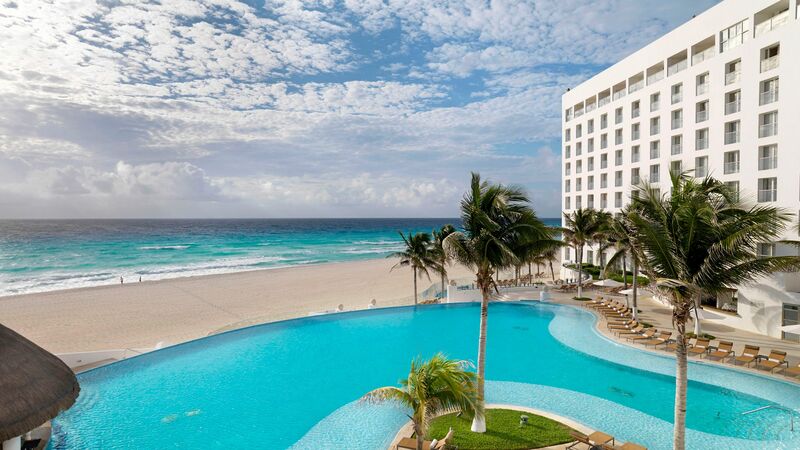 Cancun has been dubbed “the Miami of Mexico” and it’s easy to see why - perfect white sand, glamour and upmarket leisure intertwine here to create a truly exciting destination. Cancun is the perfect location for diving enthusiasts - coral reefs, caves, shipwrecks and even a fascinating underwater collection of statues can be found in the ocean. For those who prefer to stay on land, the area boasts a range of championship golf courses - head to the El Camaleon Mayakoba Golf Club at nearby Playa Del Carmen to practice your swing in the surrounds of mangroves and jungle. Some of the most captivating Mayan ruins in Mexico can be easily accessed from Cancun, including the famous pyramids of Chichen Itza. The coastal town of Tulum is just a 90 minute drive away, too, where you’ll find the ruins of an ancient civilisation, complete with pyramids and temples. Holidays in Cancun are perfect for those looking to combine relaxation with a lively atmosphere. There’s no shortage of upmarket leisure to be enjoyed here, whether that’s through exploring the chic shopping malls, indulging in one of the many restaurants or simply relaxing by the pool at your hotel. There are over 14 miles worth of beach begging to be sunbathed on, and you won’t tire of Cancun’s classic Caribbean good looks. Spend your days relaxing with a cocktail on the beach, exploring the coral reefs through a snorkelling or diving trip, or taking to the ancient ruins to indulge in some archaeological wonders. Sovereign recommends the fabulous hotel Le Blanc Spa Resort for those wanting to holiday in Cancun. Exclusive for adults, this is the perfect destination for a romantic getaway or honeymoon, where guests are treated to stunning ocean views, infinity pools and a personal butler service. Enjoy an open-air massage at the spa, or indulge in one of the 12 bars and restaurants that call this hotel home. The Yucatan peninsula is known for its underground water systems, with natural sinkholes (cenotes, pronounced ‘se-NO-tay’) filled with clear, fresh water and mineral-rich algae. Try Yokdzonot near Chichen Itza for a traditional Yucatan experience. The enterprising women of the village made this cenote visitor-friendly back in 2007, so it comes with snorkels to hire and a café with home-cooked food on the menu (think lime soup and barbecued chicken). Brace yourself before diving in from the wooden jetty, though – the water can be pretty cold. Chichen Itza is one of the most famous Mayan sites in the world. Believed to have been one of the largest Mayan cities, it covers around five square kilometres and its crowning glory is El Castillo, a vast pyramid-shaped temple with steps that climb up almost 10 storeys. El Caracol is impressive, too, built as an astronomy observatory station and most likely used for ceremonies and festivals. Meanwhile, El Templo de los Guerreros is the mammoth rainforest-backed Temple of Warriors. Cancun is big on its eco-parks: adventure and activity parks based on the rainforest, wild coastline and flora and fauna of the Yucatan Peninsula. The best-known park is Xcaret, where you can learn all about Mayan history, go rafting, swim in underground rivers and watch evening shows. It pairs up with Xenses – a theme park based on the senses. Expect mirror labyrinths, mud baths, light games and a child-friendly waterpark. Xcaret and Xenses are just an hour’s drive south of Cancun. Transfer time from Cancun airport to Cancun is approximately 30 minutes. Where can I buy souvenirs in Cancun? For a big shopping experience head to La Isla Shopping Village. It packs in more than 150 stores, restaurants, a movie theatre, an aquarium and a museum. Luxury Avenue is a more intimate affair with just 25 stores, but the exclusive shopping mall includes several designer brands. For a bustling market experience, Mercado 28 is a large souvenir market found in the centre of Cancun.